The central corridor of Southern England is the home of outstanding areas of parkland, where some of the country’s finest golf course have been created. South is rated 4.6 out of 5 based on 50 verified reviews from YGT customers. They played and stayed (we even checked they signed their scorecards). The luscious green landscapes of Berkshire, Oxfordshire and Hampshire are rich with tremendous golf courses cut through the stunning pines and oaks of the landscape. 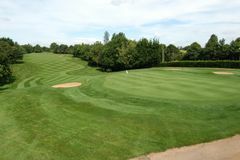 The South has a wide range of destinations for your next golf break; within easy reach of London, visitors can relax in a sumptuous country hotel like Donnington Grove or the Manor House at Castle Combe, where the traditional style and outstanding service are welcome contrast to the rigours of city life. There are also a number of excellent purpose-built resorts such as Meon Valley, The Oxfordshire and Donnington Valley, which are equipped ideally for groups of golfers and those simply looking for a relaxing getaway with maybe a spa treatment added on.